Duckweeds are tiny free floating vascular plants with worldwide distribution. Their communities occur, as a rule, in small water bodies, namely in fishponds, ditches, or lagoons. The family (Lemnaceae) consists of about 35 species in four genera, Lemna, Spirodela, Wolffiella, and Wolffia. Duckweeds are among the fastest growing plants in the world, frequently doubling their biomass under optimal conditions in 2 or 3 days with night growth equaling or exceeding day growth for some species. aLoading for BOD5 and TSS given in units of kg ha 1 d 1 and for TN and TP given in g m 1 yr 1. Based on the results from 14 systems in the USA and Japan. Adapted from Vymazal J (2001) Types of constructed wetlands for wastewater treatment: Their potential for nutrient removal. In: Vymazal J (ed.) Transformations of Nutrients in Naturaland Constructed Wetlands, pp. 1 93. Leiden, The Netherlands: Backhuys Publishers. temperatures between 35 and 40 °C. Below 17 °C some duckweeds show a decreasing rate of growth. Duckweed can tolerate a wide range of pH (3.0-10.0), but displays optimum growth in a medium of 5.0-7.0. Duckweed, compared to water hyacinth, plays a less direct role in the treatment process as it lacks extensive root systems and therefore provides a smaller surface area for attached microbial growth. The main use of duckweed is therefore in recovering nutrients from secondary trea ted wastewater. A dense cover of duckweed on the surface of water inhibits both oxygen entering the water by diffu sion and the photosynthetic production of oxygen by phytoplankton because of the poor light penetration. The water becomes largely anoxic, which in turn favors denitrification. Nitrification of ammonia occurs within the aerobic root zone of duckweed. However, this layer is very thin and therefore little nitrification occurs in duckweed based systems. Denitrification occurs in the much larger reduced zones in the water column. However, the nitrification/denitrification complex is not very effective for nitrogen removal because of limited nitrification in the system. The major route for phos phorus removal is direct plant uptake. Other removal mechanisms play negligible role in phosphorus removal. Duckweed can accumulate large amounts of mineral nutrients in their tissues and concentrations as high as 7% N in dry mass of Lemna gibba and 2.9% P in the dry mass of Spirodela polyrhiza were obtained under laboratory con ditions. 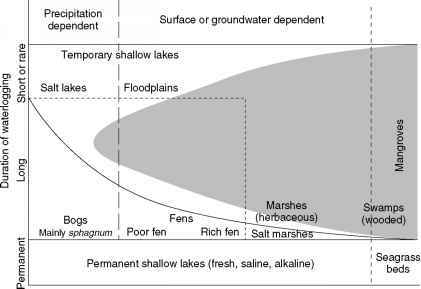 However, concentrations higher than 4% N and 1% P on dry mass basis are commonly found in natural wetlands. When growing in wastewater, concentrations of N may reach the values up to 7.3% and concentration of P may exceed 2.5%. Harvesting of duckweed is essential in order to main tain high growth rate (and nutrient uptake). In addition, if duckweed is not removed from the pond, the nutrients are very rapidly released from their decomposing detritus back into the water. The field experiments show that daily harvest and maintenance of a near optimum stand ing stock yields 58% more duckweed than harvesting once in 6 days. The optimal harvesting regime can be assessed in two ways: (1) empirically, as a choice of the best ofmany variants tested; and (2) mathematically, ifthe growth function is known and estimates of its parameters can be made. In the majority of cases, the studies on duckweed harvesting were exclusively empirical. The use of duckweed for wastewater treatment is not as well developed as hyacinth systems even though the first attempt to use these plants were carried out 40 years ago. The retention time in duckweed based wastewater treatment system depends on wastewater quality, effluent requirements, harvesting rate, and climate, but it varies typically from 30 days during summer to several months during winter. The basin configurations suggested for duckweed ponds are L:W = 15:1 to ensure plug flow conditions. A screen or other baffling system is essential at the outlet of the basin to prevent loss of the small floating plants with the effluent. The system depth varies between 0.4 and 3.0 m.
The results presented in the literature are scarce, not convincing, and often quite contradictory. Some results indicate a very good treatment performance but on the other hand some studies indicate nearly zero treatment effect. However, as for water hyacinth based systems, expensive operation and maintenance cost make these systems rather ineffective as compared to other treatment technologies. Duckweed voluntarily grows in many FWS CWs but when not harvested its contribution to the over all treatment effect is negligible.